My husband and I are obsessed with butter beer which can be found at Orlando’s Universal Studios Islands of adventure in Harry Potter world. check out my recipe HERE. Last week I made a scrumptious batch of butter beer and had a lot of leftover rum caramel. 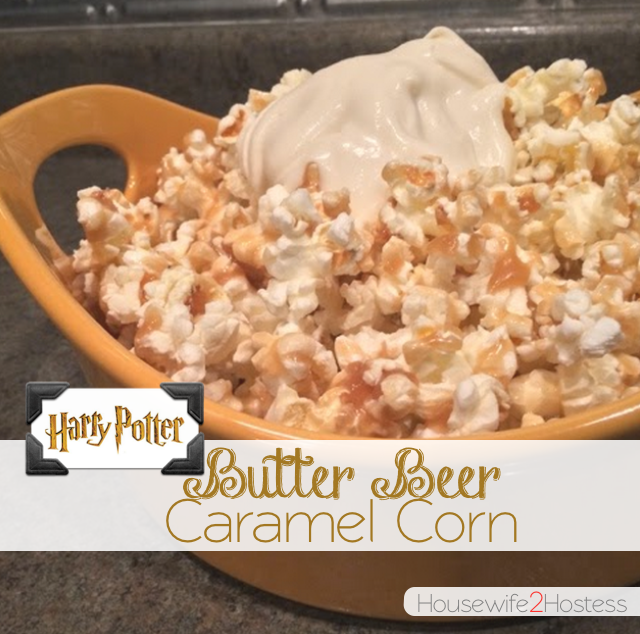 Almost immediately this brilliant idea popped into my head and I thought: What if made butter beer flavored caramel corn? So I did. WARNING: it’s really addictive. Stir in the condensed milk, butter, salt, vinegar and 1/4 heavy cream. Set aside to cool to room temperature. For the cream topping: In a medium bowl, combine 2 tablespoons of the brown sugar mixture and the remaining 1/2 cup of heavy cream. Use an electric mixer to beat until just thickened, but not completely whipped, about 2 to 3 minutes. To serve, pour caramel and coat popcorn evenly. Add whipped cream just before serving and ENJOY!